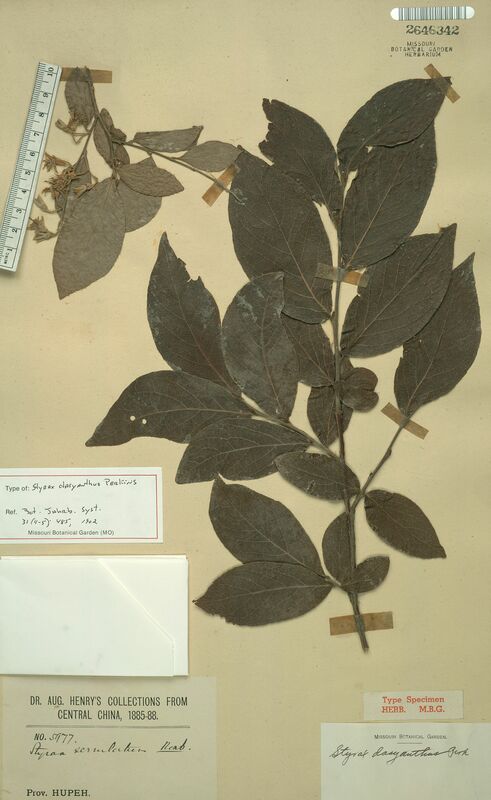 Styrax argyi H. Léveillé; S. rubifolius Guillaumin. Trees 3--20 m tall. Trunk to 24 cm d.b.h. Branchlets densely gray-yellow stellate pubescent, becoming purple and glabrous. Leaves alternate; petiole 3--7 mm, densely stellate pubescent; leaf blade obovate-elliptic to elliptic, 7--14(--16) X 3.5--6.5(--8) cm, leathery to almost leathery, sparsely stellate pubescent and glabrescent or hairy only along veins, base cuneate to broadly cuneate, margin denticulate and slightly revolute, apex acute to shortly acuminate, secondary veins 5--7 pairs, tertiary veins reticulate and conspicuously raised. Inflorescences terminal or axillary, paniculate, many-flowered, 4--8 cm. Pedicel 6--10(--12) mm. Flowers 0.9--1.6 cm. Calyx ca. 4 X 3 mm; teeth 5, subulate to deltoid. Corolla tube 2.5--3 mm; lobes oblong to oblong-lanceolate, 6--8.5 X 1.5--2.5(--3) mm. Filaments expanded, free parts basally densely white villose. Fruit ovoid to globose, 9--13 X 5--7 mm, smooth or rugose, densely grayish stellate tomentose, apex shortly pointed, exocarp 1 mm thick or less. Seeds brown, smooth. Fl. Mar-May, fr. Sep-Dec.
* Mixed forests; 100--1700 m. Anhui, Fujian, Guangxi, Guizhou, Hebei, Henan, Hunan, Jiangsu, Jiangxi, Shandong, Sichuan, Yunnan, Zhejiang.